Business leaders that are internationalizing their company must first examine where they can locate their operations. China, the traditional hub for Asia bound investment, is quickly shifting from a low cost hub for manufacturing towards high-end production destination with a thriving middle class. Countries within Southeast Asia, on the other hand, are emerging as the replacement for basic manufacturing and assembly. Amid this shift, Vietnam has become the standout for investors. Vietnam is a much different market from China, presenting a unique set of challenges for investors. Growing rapidly from a relatively low economic base, each area of the country presents a unique set of conditions for investment with both opportunities and constraints. Seasoned investors and new entrants to Asia alike find that Vietnam’s cities and regions can each present unexpected challenges, and leave projects without resources if pre-market entry due diligence is not conducted. Dezan Shira & Associates has a growing team of pre market entry specialists throughout Vietnam providing our clients with years of combined experience assisting foreign enterprises navigate the nuances of the Vietnamese market and effectively select optimal locations for investment. 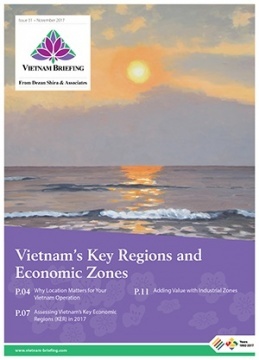 For questions on how to assess investment requirements, compare locations for establishment, and leverage the power of industrial zones in Vietnam, please contact us.